The United States overcame an early deficit against tournament debutants Myanmar in their opening match at the FIFA Under-20 World Cup on Saturday. Yan Naing Oo put Myanmar ahead after only nine minutes when he stabbed home a shot at close range after the Americans failed to clear a corner. Goals to Maki Tall in the 17th minute and captain Emerson Hyndman in the 56th clinched the win which took the U.S. to the top of Group A. The winning goal came from a counter-attack led by Rubio Rubin who provided the pass for Hyndman to score. ”We didn’t play how we wanted to play, that’s for sure,” U.S. coach Tab Ramos said. ”We found in front of us a very inspired team, a newcomer coming into the World Cup and they fought hard. Argentina captain Angel Correa scored both his team’s goals as the tournament favorites were held to a 2-2 draw by Panama. Correa underwent surgery last year after a routine medical checkup revealed a blocked ventricle in his heart and was sidelined for seven months before rejoining his team just in time for the South American qualifying tournament. Correa dispelled any doubts about his fitness Saturday when he put his team ahead in the Group B match with goals in the 14th and 79th minute. But Panama quickly replied on each occasion to take only their second point from a match at the Under-20 showpiece. In other matches on the opening day of a tournament which began in the shadow of the FIFA corruption scandal, hosts New Zealand drew 0-0 with Ukraine and the United States came from a goal down to beat Myanmar 2-1 in Group A. Yaw Yeboah scored from the penalty spot in the 90th minute as Ghana drew 1-1 with Austria in Group B.
Correa is tipped as a likely star of this World Cup, set to follow illustrious compatriots Diego Maradona and Lionel Messi in using the Under-20 tournament as a pathway to fame. He produced a mature and composed performance which did everything but lift Argentina to victory. Correa received a flat cross from Tomas Martinez in front of goal in the 14th minute and shrugged off pressure from defenders to divert the ball past Panama goalkeeper Jamie De Gracia. Panama equalized within five minutes with a goal which staked an early claim to being the best of the tournament. Jhamal Rodriguez took the ball on his right foot 20 meters from goal and threaded his powerful shot between defenders and into the top-right corner of the net. Panama troubled the Argentina defense throughout the match, managing 12 shots on goal but Correa seemed to have clinched a win for his team with his goal in the 79th minute. He swept on a ball that had been parried by De Gracia, who was taken off his line, and slotted the ball into an unguarded net to put his team ahead 2-1. 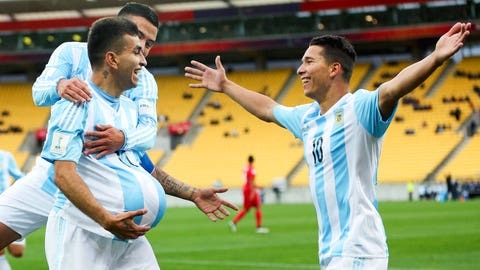 Angel Correa celebrates his goal with Argentina Under-20 team-mates Leonardo Rolon and Tomas Martinez (R). But Panama again rallied and scored only five minutes later through Fidel Escobar to earn a draw and increase its chances of advancing to the round of 16. In the opening match of the tournament, Ukraine tried hard but was unable to break down New Zealand’s defense. Ukraine had 17 shots on goal to New Zealand’s six but most attempts were off target. Artem Biesiedin twice came close to scoring for Ukraine but couldn’t finish while New Zealand almost stole the three points with a late, sliding shot by Noah Billingsley which was saved by Bohdan Sarnavskyi.